What the hell do you know about surfing, Major? You’re from goddamned New Jersey! Podcast 50! The big 5-0. That’s right, we’re almost half way through our list of 101 Films. To celebrate we didn’t want to do any old film, but a bona fide classic. So after much discussion, and having a quick check which films I hadn’t seen (let’s be honest, it’s always me who hasn’t seen the big films) we went for Apocalypse Now . Apocalypse Now is the last great ’70s’ movie. This is the second Francis Ford Coppola film on our list, which in 101 Films terms makes Coppola as good a director as Robert Hamer – well done Francis! 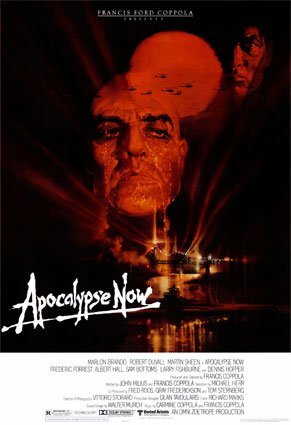 Set during the Vietnam War, Apocalypse Now follows US Army Special Operations Officer Captain Willard, played by an intense Martin Sheen, as he journeys up the Nung River on a mission to kill the gone-rogue Colonel Kurtz, played by an even more intense and pretty much insane Marlon Brando. I think it would be fair to say that Lewis and I did worry that we had bitten off more than we could chew in covering this film. Simply put, there’s too much to talk about! There’s the amazing direction, the haunting images and story, the fantastic and bizarre performances, the insanity of how the film was made, the various interpretations of what the film says about war… Where do you start?! Well, we’ve never let our own ignorance or lack of preparation stop us from talking about a film before, and we’re not going to let it stop us at number 50! So we did the usual: dived in and talked about what we saw in the film and what it made us think about. Hope you enjoy it. In hindsight the film was a good one to pick for our 50th as there seem to be a lot of parallels between what it had to say about the Vietnam War and us doing these podcasts – both seemed never-ending, both slowly destroyed those involved and, at the end, both seemed like a terrible waste of time. The horror… the horror. We have an extra special Secret Sponsor this week. Over the last few weeks we’ve been asking people to like our Facebook page, in particular we wanted to get 50 likes by our 50th podcast. Long-time listener and friend of the show Eoin Boyle heeded our call and was the 50th person to like the page. Not only that, he also recommended Apocalypse Now. So congratulations Eoin, when the history of 101 Films comes to be written, you will be at the very least an important footnote. Though he doesn’t have a blog or podcast you can get all the Boyle action you need by following him on Twitter: @e_boyler. Thanks to everyone who has listened to our podcasts over the last 18 months or so. We feel the best is yet to come and have all sorts of plans for the future. Keep sending in those recommendations!